Universiti Washington (Bahasa Inggeris: University of Washington, singkatan UW, Washington atau U-Dub) merupakan sebuah institusi pengajian tinggi awam di Seattle, Washington, Amerika Syarikat. ^ Buhain, Venice (May 25, 1999). "But what does it mean?". The Daily. ^ As of June 30, 2016. "U.S. and Canadian Institutions Listed by Fiscal Year (FY) 2016 Endowment Market Value and Change in Endowment Market Value from FY 2015 to FY 2016" (PDF). National Association of College and University Business Officers and Commonfund Institute. 2017. ^ a b c "Fast Facts: 2017". University of Washington. ^ "Colors". 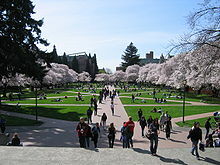 University of Washington. Dicapai December 3, 2016. Laman ini diubah buat kali terakhir pada 00:23, 6 Oktober 2018.